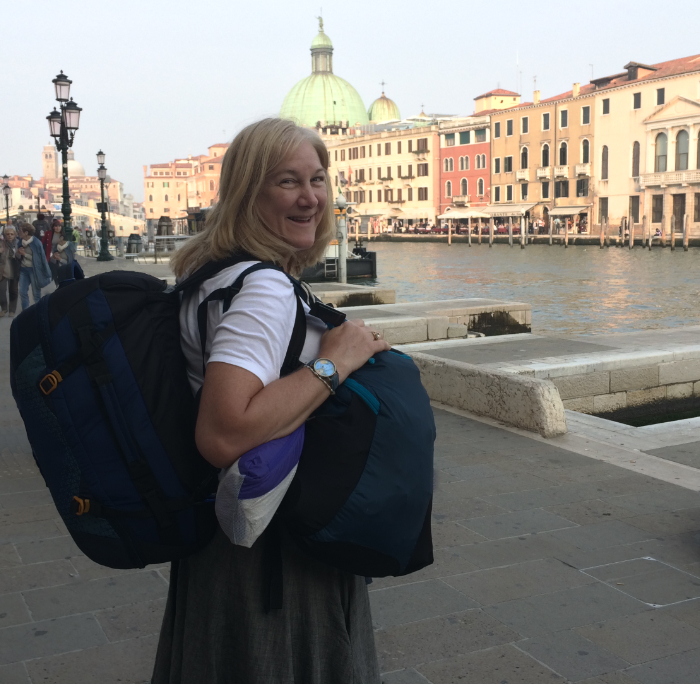 This is me — with ALL of my stuff, walking to my Venice accommodations. The blue daypack was replaced for my next trip. So many women confided they newly had or would soon have the freedom and time to travel…. They were intrigued by my travels. They wanted to hear where I went, what I did, and how I pulled it off. So this site is for them, and for you if you’re in those shoes. Men and women of all ages ask me for packing and travel tips so you’ll find some of that here as well. In 2017, while getting ready to travel again between travels, I shared my ever-evolving packing choices (which I keep updated) and I invite you to read the apprehensive side of leaving again. Getting out of the US wasn’t easy that time as you’ll see in Stranded in an Airport and Stranded no more. Just 2 months into my next adventure I learned of a can’t-miss wedding, so I returned to LA after only 4 months. In those 4 months, I visited Sicily, mostly on an organized tour, actually by La RosaWorks, then more of Italy, Slovenia, Bratislava (Slovakia), Prague (Czech Republic), Israel, and Cyprus. I then stuck around CA for another wedding seeing International Travel Goods Show 2018 and Travel & Adventure Show 2018 in Los Angeles. Six months later I was off to England for a small-town stay to work on my book about travel. Within and after that, I traveled to Wales and later Northern Ireland and Ireland. From there I flew RyanAir to Germany and from the airport, took Flixbus into Austria where I was met by a friend that goes back to my first long-term travels. I had a fantastic time with her and her family. A funny thing happened though. After only five months, I was asked to house-sit for some months, so I’ve come “home” for that and got to teach a seminar about this type of travel. I’ll be heading out in another month. I was invited sailing and I can’t resist that. Whether you’re over 40, in your 50s, or 60 or 70, if you’ve wanted to travel the world but feel you don’t even come close to having the money to do so, maybe you actually can. What if… you changed your perception of travel from vacation to experience — and found you really could pull it off? Wondering if you’re “too old” to travel because there won’t be so many independent travelers your age? What I found in my 50s is that because everyone brings their culture, viewpoint, and knowledge to a conversation, I never felt old or too old to be in the conversation. When 26, my daily travel friends were all ages, too. Don’t let your age, whatever your age, stop you from traveling independently. Part of my own method was to stop renting an apartment. (My landlord needed it back so I made lemonade and full-filled my hopes of traveling again.) Absent a great apartment, I turned my rent money into travel money. It costs less to rent a dorm bed or a room almost any place in the world than it did for me to rent my LA apartment any given night! I don’t have rental income as you might, but I continue to do my regular job from wherever I am. If I you have a home you can rent it out and that rent could be your travel money. Or you can house swap. You don’t have to be wealthy or well-off! You can do it! If my travels inspire you to come out into new places and experiences — great! If my travels are good reading and bring you into my life to share it and learn from it — fab. If you cannot travel physically, traveling vicariously is the next best thing, so I hope I do a good job of making people’s lives real for you. BTW, I have also started teaching travel and am working that out. PS: Here’s some great inspiration from Theodor Seuss Geisel, aka Dr. Suess!